Warning: Display title "<i>Bart Simpson #24 - Cartoon Genius</i>" overrides earlier display title "<i>Bart Simpson #24</i>". The Maggie & Moe Mysteries! 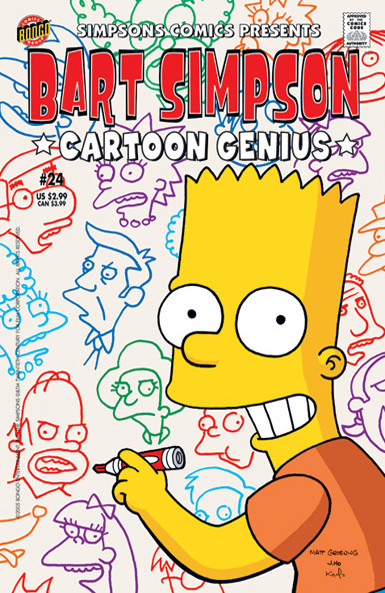 Bart Simpson #24 was released in USA in June 2005. 1.3 The Kiss of Blecch! 1.4 The Maggie & Moe Mysteries! Main article: Bart's Got Spirit! Main article: The Kiss of Blecch! Main article: The Willful Will! Modified on February 27, 2018, at 18:33.